Fraser, Mary and myself crowded into the back of the mini bus as it screeched out of the hostel car park and down the Bruce Highway. Still on a ‘high’ from the previous day’s skydive we would now be hurling our bodies down the rapids of the Tully River in a little inflatable dinghy. 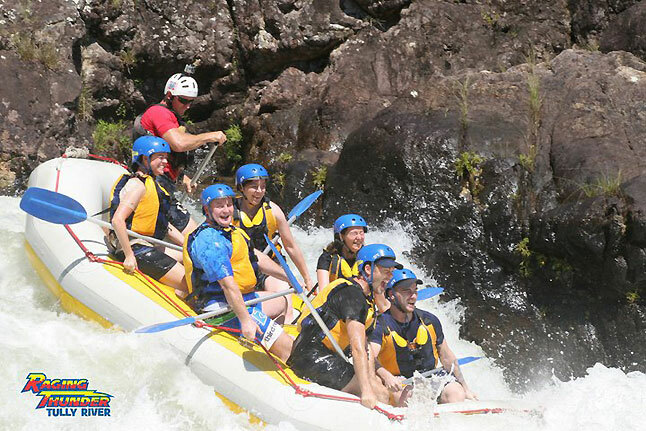 It was time for some white water rafting. On the drive we were divided into groups of six and kitted up with Jesus style sandals, life vests, wetsuits and paddles. As bad luck would have it the three of us were unfortunately paired with a trio of ‘mature’ crew mates, who upon seeing our enthusiasm and fearlessness were evidently regretting not having opted for the cheaper package. Our cox for the day was a lovely Spanish fellow and following a quick safety brief he steered the raft out into the current. It was time to soak up the white waters. Off we set, paddling aggressively and screaming “EXTREME! !” at 30 second intervals… well half of our raft’s passengers anyway. The rapids were a lot faster than I expected and it took some careful balancing and positioning simply to avoid falling into the choppy waves that persisted on crashing over the sides of the raft and soaking us through. One of the elderly women was evidently not happy with this and kept complaining that her hair was getting wet. This isn’t meant to be a trip down an amusement park’s ‘lazy river’ darling! After righting ourselves we continued the journey, quietly sliding along the ribbon of water that weaved its way through the dense foliage overhanging each bank. This eventually broke into a clearing that was home to a massive tower of rocks and the Spaniard docked the raft to let us test out diving skills. Leaping from the platform with screams of ‘EXTREME’ echoing around I hung for an age before crashing ungracefully into what felt like a concrete wall of water. My attempt at some Tom Daley finesse had clearly not paid off and what was originally meant to be a classy swan dive turned into an uncontrollable mid-air tumble whose crescendo was a belly-flop splash into the pool below. Letting go of the raft I was immediately dragged under by the current and for the next twenty seconds found myself fighting the urge to start paddling as I was flung down the rapids in a coffin-position: “please don’t let this be my funeral” the untimely phrase repeating in my head. After twenty of the looooongest seconds I was rewarded with the sweet sweet taste of fresh air; my life-vest having served its purpose. The group members popped up behind one by one and we gathered to watch the Spaniard expertly weave the dinghy down through the minefield of rocks we ha just traversed. Stroking our paddles some more then brought us to the end of our rafting adventure: tired, sunburnt, and drenched. Despite being overpriced, this adrenaline fuelled day on the Cassowary Coast of Queensland was a fantastic experience, and one that if you happen to have some reserves in the travel budget I would thoroughly recommend. That must have been scary to be towed by the water – what grade were the rapids? That sounds like a crazy experience! I’ve never been rafting, but it’s on my bucket list. I’ve always been scared that I would die on a river rafting trip. Would you recommend taking your family on this type of adventure?